This isn’t baking but the recipe is so good I need to shout about it! The problem with online supermarket shopping is you actually notice how much you are spending when you are stacking your trolley up with goodies, whereas in a bricks and mortar supermarket you don’t really find out until you’ve already committed to buy it. I kept putting a new litre bottle of £20 Baileys Irish Cream in my virtual trolley, and then taking it out to save for a week when the rest of the shopping was cheaper (this never happens). Baileys always seems expensive for something that is only 17% alcohol. Then as part of an ongoing thing I have going on with trying to buy ingredients rather than ready-made items as much as possible, I thought “Can I make it myself?” and I found a recipe at the BBC and thought it was worth checking out. Of course you still need to buy the Irish Whiskey to go in it (my “make it yourself” kick hasn’t got as far as distilling whisky… hmmm). But you only add half a bottle of Jameson’s. So only £11.50 of whiskey, plus £1 of single cream and £1.44 for a tin of condensed milk. That makes a bargain £14 for a litre of homemade Irish Cream. I’m not going to try and cost the extra bits of flavouring you add as well! So a 30% discount over the ready made price isn’t bad. But the bonus is that it tastes really, really, really good. It was in the back of my mind that it might taste like a cheap rip off version despite the good whiskey, but it actually gives you that fabulous homemade “Whoa! Why was I buying this rather than making it? !” kick that all the best home bakes, cakes and jams do. I will see how it keeps (the recipe says two months in the fridge) but I can’t see myself buying the Baileys again. I’m also thinking of how nice it would be to experiment with different flavours. I didn’t have any Camp coffee to use this time so I’d like to try that. More chocolatey would be good obviously. Could you add vanilla pods to infuse? I’ve had ready-made rum cream liqueur before which was nice too. Lots of ideas. A quick count up of the calories in it actually managed to give me a lower number than Baileys which surprised me, perhaps I need to double check on that. 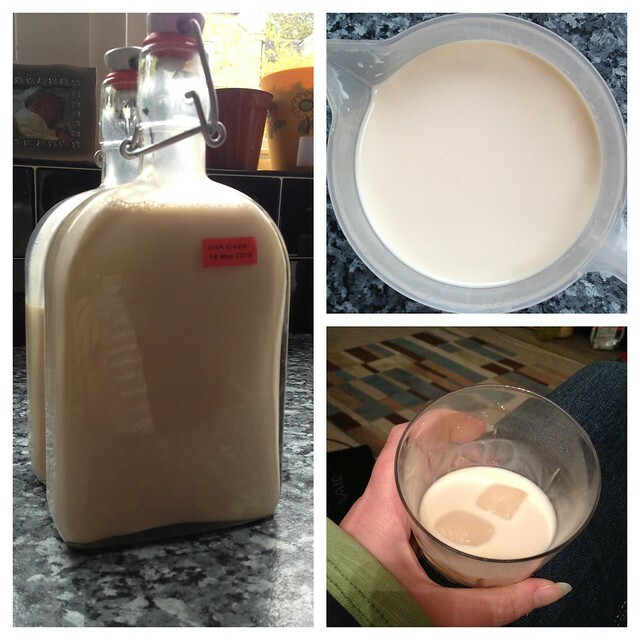 The homemade version works out to be slightly lower alcohol content and a bit thinner than Baileys though which may account for the difference. Overall I am really very impressed and wish I’d thought of the idea of making my own years ago. Lately this is mostly a feed of things I get up to, and find interesting, amusing or timewasting in other places. You can find me on goodreads, flickr, twitter, facebook, ravelry and pinterest among others.